Hi and Welcome to Red Couch Recipes. 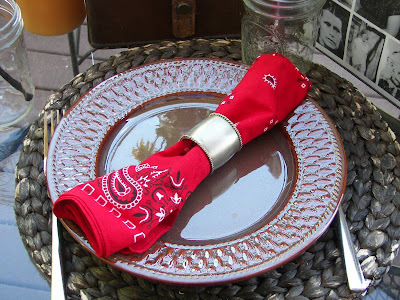 Today's tablescape is a tribute to my Pioneer Heritage on my mother's side of the family. July 24th is known throughout Utah as Pioneer Day. 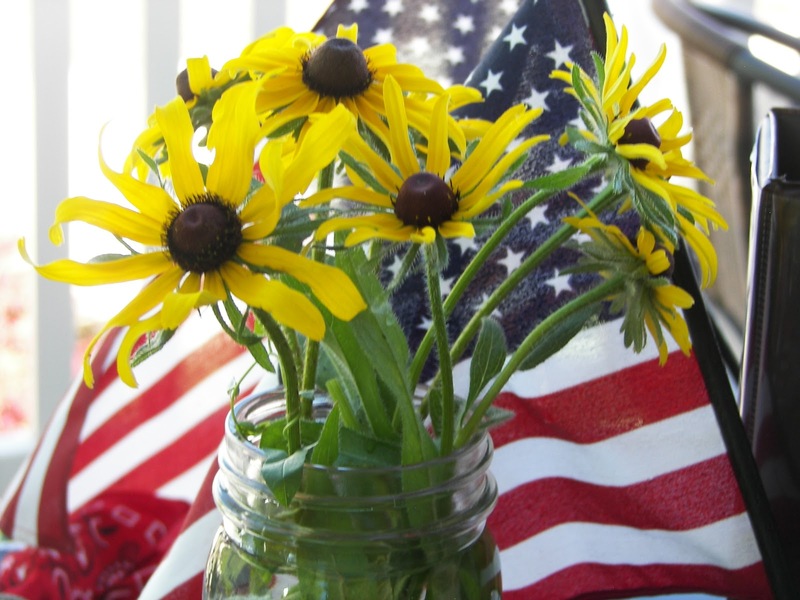 State Worker's have the day off and Salt Lake City, and many other smaller communities hold Pioneer Day Celebrations which include, rodeos, parades, and dutch oven cooking. Last summer the Littlefield side of the family held a family reunion in Tropic, Utah, my mother's birthplace. My mother's brother Heber and his wife Beverly presented us with two huge binders full of genealogy and stories of Ellis Waldo Littlefield and Ida Riding Littlefield, my grandparents, and their ancestors. It was a labor of love and a treasure trove of information. Many of my mother's ancestors emigrated to Utah to escape religious persecution and to join up with the main body of Latter-Day Saints headed to Salt Lake City. In Utah, one is considered an official pioneer if one arrived in Utah before the train service was generally available in 1861. The dinner plate is a simple brown plate. The glasses are mason jars and the napkins are bandannas. The napkin rings are metal. One of my ancestors, Christopher Lister Riding, was born in Burnley, England and married Mary Anne Hale. They emigrated to the United States in 1846 and left St. Louis in 1851, with their four children, to cross the plains to Utah. They established themselves in Southern Utah. Christopher was a master workman who traveled around Southern Utah with a two-wheeled cart and an ox selling tinware. He was sometimes known as the "Tin Man." He did metal work on the St. George Temple and St. George Tabernacle. Maybe Christopher Lister Riding made metal napkin rings? 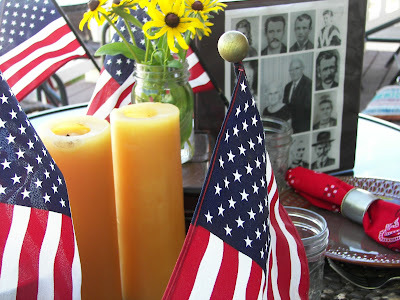 I set the table with American Flags because it was to America that my ancestors fled to have religious freedom. 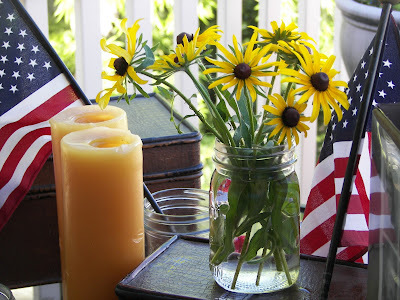 I adorned the table with simple wildflowers from our garden -- flowers they might have seen as they crossed the plains. Waldo Littlefield and his wife Mary and his family joined the LDS faith in 1832. They moved with the main body of church members to Missouri and left when Governor Boggs issued an "extermination order"-- in essence an order to kill all LDS members. They then moved to Nauvoo, Illinois and built a home. When the Propher Joseph Smith and his brother Hyrum were killed by angry mobs, Waldo and his family left Nauvoo in the winter of 1846 with his wife and four children. They lived in Iowa for six years farming and outfitting other church members to cross the plains. Finally in June of 1953 Waldo and his wife Mary and their now five children left for Utah. It took them three months to cross the plains. 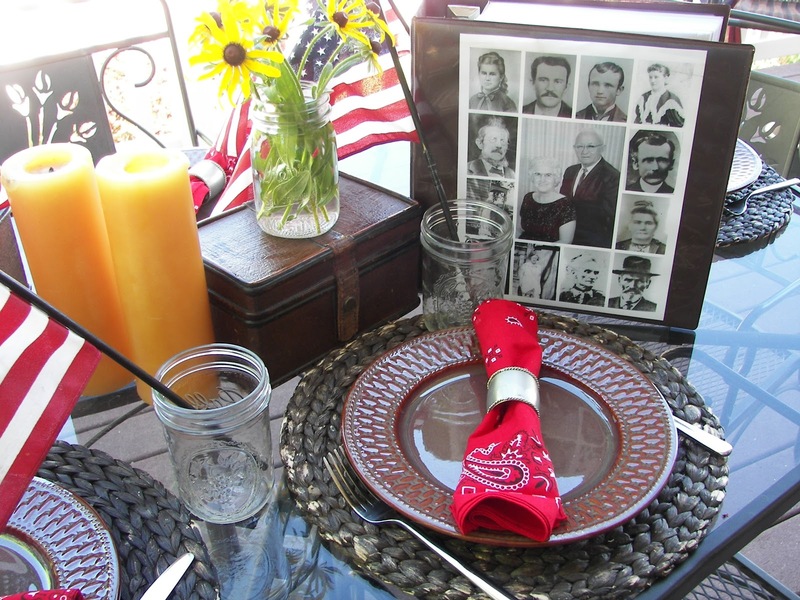 I honor my Pioneer Heritage with this tablescape. I honor their dedication, hard work, courage and perseverance. I honor their desire to sacrifice all they had to travel to a place where they could worship God as they pleased. What interesting stories of your ancestors. I love to hear about that. Can you imagine packing up 5 children and moving in a wagon. It is hard enough to get 3 children to go to FL now in an air conditioned mini van with a portable DVD player and smart phones. LOL Your table is very pretty and it was perfect for you pioneer remembrance. That must have been an interesting trek to Utah for a family with 5 kids! I love your simple table, Joni...you can do so many things with brown plates. How interesting and what a wonderful gift of information you received. The table is a wonderful tribute. I have never heard of this celebration and I love learning new things! What a wonderful tribute to your family, Joni. 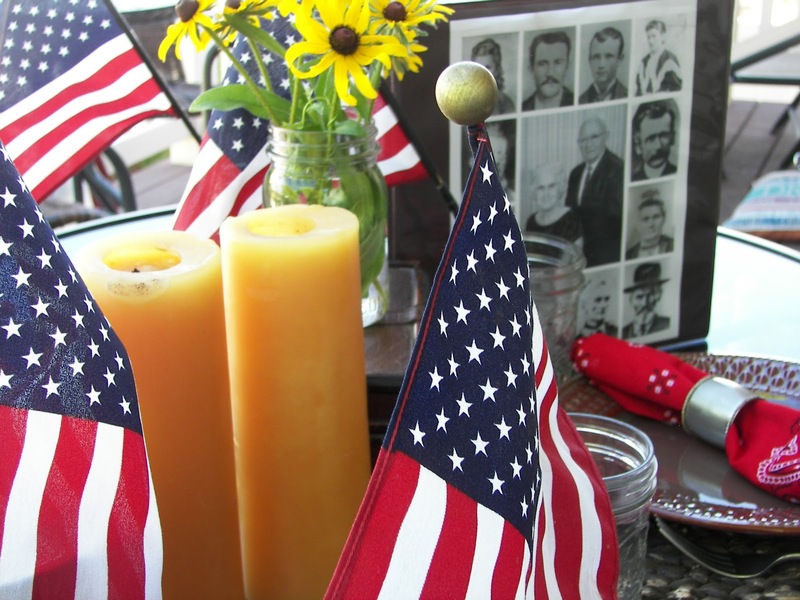 Your table is beautiful and so patriotic. You are so fortunate to have your family history in book form where future generations will be able to know and appreciate their family history. Such an interesting table with the story. Heritage is so fascinating especially when you can piece together stories like this. Makes one understand a little more about themselves too. How nice to have such a detailed history of your family! I love how you brought together the brown, red and yellow for your table. Very fun. You are so lucky to have the information about your ancestors that you do, Joni! It is a treasure to cherish & pass on. I am now keeper of our family's HUGE photo album & I'm slowly scanning all of them & getting the up onto the Ancestry.com website. Years ago, I used some software from the Mormons in Utah to document my family's ancestry. It was very helpful in getting me started. Your table is wonderfully done. Bandanas make great napkins, don't they! That was so interesting, Joni. I know little about the history of your part of the US and little about the religious persecution. I'm going to have to do some serious googling and reading. It's important to keep the memory of our ancestors alive - what a generous thing your aunt and uncle did for each of you! What a precious post...very interesting. Hi Joni! What a sweet table and even sweeter reason to honor your ancestry! You're red, white and blueing too! Thank you so much for popping in to see me. When my daughter was delivering her BIG baby boy on the 4th of July, she commented on how grateful she was to be in a comfortable hospital as opposed to delivering a baby on a wagon train! Great tablescape, Joni! Oh, you had me with that first photo of black-eyed Susans in a canning jar! What a wonderful table for Pioneer Day! I think it's wonderful that you know so much about your family's history and celebrate it annually. A very meaningful table! What a wonderful post and tribute tablescape! Thanks for that. I too am thankful for my Pioneer heritage. Southern Utah is a wonderful place to live, and I wouldnt be happier anywhere but here. Your table is beautiful and leaves me inspired. What an interesting heritage. Love the wildflowers on your pioneer table. Oh my goodness your tablescape looks awesome!! It all looks so beautiful!! I loved you stories of your pioneer ancestors. We owe them so much. And your table makes me happy just looking at it. Happy Pioneer Day. I missed it this year as we are traveling in the Northeast. 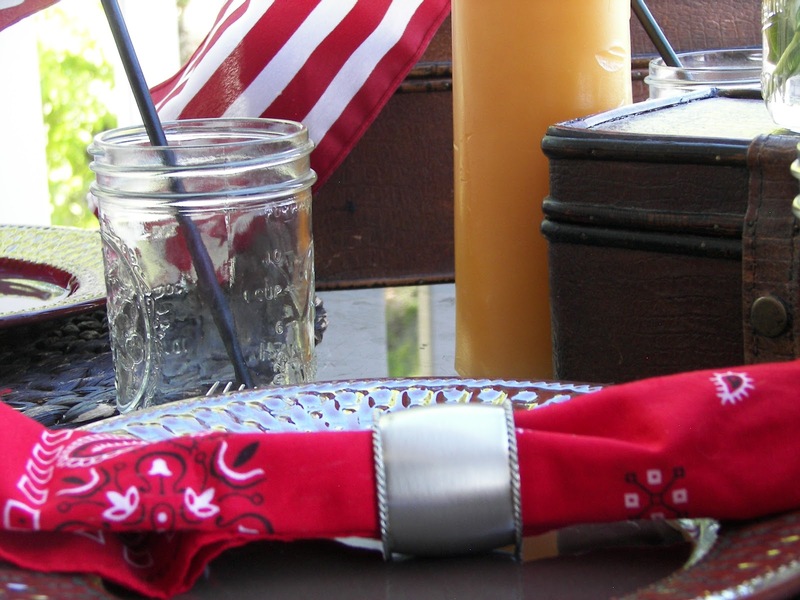 Your table is beautiful and so patriotic. You are so fortunate to have your family history in book form where future generations will be able to know and appreciate their family history. I love stories intermingled with tablescapes. What an interesting post!